Linda is shown with one of her four children. Since entering WEEP (Women Equality Empowerment Project) in 2015, through our partners HEART in Kenya, Linda has become a healthy, happy income generator for her family ~ while doing something she loves to do... making jewelry. Linda is photographed making an order of 200 beads for us! She has truly become an example and a success story! Linda graduated from WEEP in August, 2017. By the time she had graduated, she had learned how to sew dresses, perform basic business skills and even to make a presentation to a group. 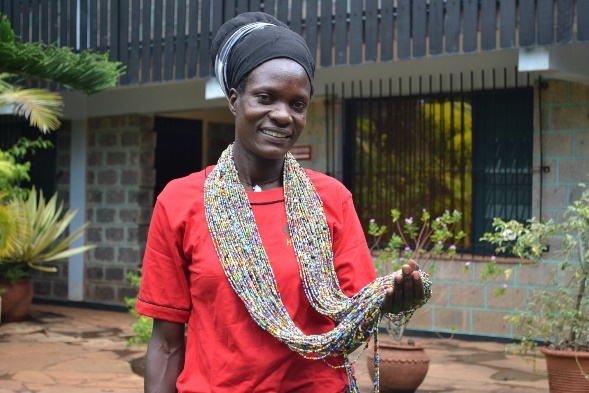 Along with her jewelry making and artisan skills, Linda has earned the respect of her peers, her teachers and those with whom she does business. We are so honored to partner with her and tell her story. Well done, Linda!